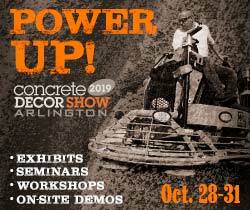 As decorative concrete continues to grow homeowners are seeking for contractors who can make their entryways, patios, driveways, interior floors and other concrete surfaces stand out. As decorative concrete continues to grow in popularity across the country, more and more homeowners are seeking contractors who can offer them that extra special something to make their entryways, patios, driveways, interior floors and other concrete surfaces stand out. 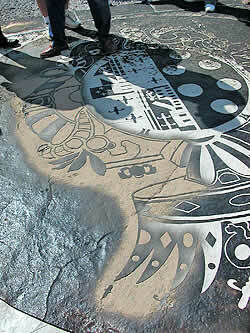 And there’s no rule that says concrete contractors are the only ones privy to the work. 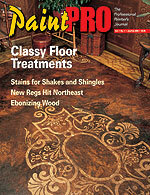 Modellos, one-time-use decorative masking patterns. All three of these techniques can be used to form positive or negative images in any size imaginable. And usually, you can expect to receive your customized product within a week’s time after you sign off on the final design. 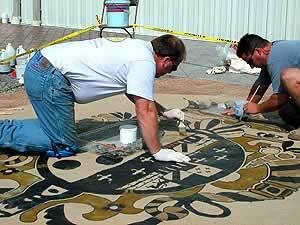 If you want to leave a truly lasting impression, sandblasting stencils will produce images that look like they’ve been carved in stone. 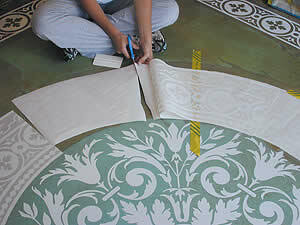 Besides borders, “There are so many awesome things you could do with stencils, such as rug designs, medallions and room centerpieces,” says Glen Roman, technical representative for Rancho Cucamonga, Calif.-based Brickform Rafco Products, a company that manufactures these specialty stencils. Roman says his company currently carries 12 stock border designs but adds that “99.9 percent of our work is all custom made.” On average, he says, expect to pay about $9 a square foot for a finished template, less if it’s a really big job. If you want a custom stencil, contractors can send black-and-white camera-ready artwork, paper or digital high-resolution images, clip art from various art books or CAD renderings, but “Computer-generated vectorized images are the best,” Roman says. On the other hand, if you have a slab that contains large pieces of aggregate, it won’t do very well with an intricate design. “Aggregate is a very important factor to consider,” Roman notes, “as aggregates will not accept a chemically reactive stain.” In those instances where additional color is desired, he adds, you’d be better off with a paint-type coloring agent. While training is not necessary to successfully sandblast, it is advisable, he says. Although Brickform Rafco doesn’t operate a training center, its distributors across the country hold periodic one-day classes at their various locations. Classes, which are a combination of demonstrations and hands-on training, typically are free. Most contractors that apply a sandblast stencil rent the sandblaster, compressor and necessary safety equipment for about $200 a day, Roman says. Besides this equipment, he adds, you’ll need application tools such as nontransfer duct tape, pick tools and disposable razorblades. In some instances, you may need a roofing torch when applying in cold temperatures or when you encounter a coarse broom finish or textured concrete surface. This will make the template more pliable, he explains. Flattoos, which are made out of a semi-transparent vinyl adhesive material, come in more than one piece. “The larger the design, the more pieces it comes in,” says Doolan. They can be placed on any unsealed vertical or horizontal flat cementituous surface, including overlayments. 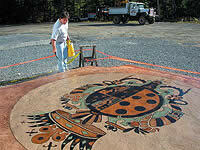 The surface needs to be dry before applying a Flattoo, Doolan says. She advises contractors to take a Flattooing workshop to learn the proper techniques, which can include color layering. The next class, which covers a variety of decorative techniques, will be offered Feb. 17-18 at The Stamp Store in Oklahoma City. “At our workshops, nobody stands around and watches. Everybody has their hands on a Flattoo,” she says. She also holds one-day workshops about three times a year at her facility in Arizona. These classes cost $200 a person.